Not Your Average Style Fix: Alexander McQueen scarf giveaway! Not Your Average Style Fix has recently turned 1 year old! Starting a fashion blog was for me both a challenge and an opportunity and frankly I had no idea how far I'd come. Working for this blog made me realise where my loyalties truly lied and what my dreams for the future are. One thing is for sure, I wouldn't have managed anything without my lovely readers, to whom I am very grateful. That's why I'm organising a small giveaway competition for all you guys who read this blog. 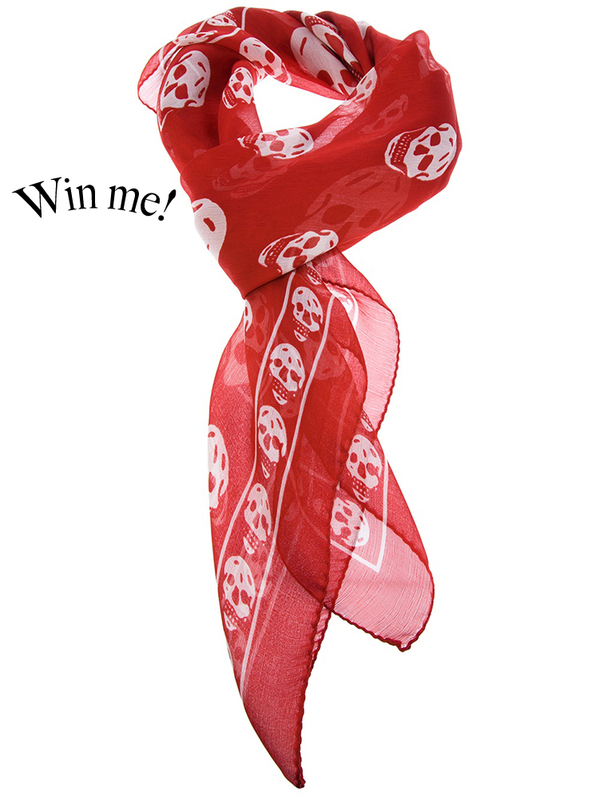 Here you have the opportunity to win this dark red, silk-shiffon, iconic Alexander McQueen scarf. Needless to say it goes with everything and everyone should own at least one! 1) Follow Not Your Average Style Fix on Bloglovin to keep up with my future posts! 2) Then, leave me a comment below or send me a message with your email address! The winner will be contacted by emai! So stay tuned and share it with your friends! Good luck to you all and thank you for everything! You have won your challenge to create a fashion blog rich of your passion. Un petit message de France !! Joyeux premier anniversaire. J'aime ton blog et tes looks !! Congratulations on that first year. I've always followed from bloglovin. Happy First Birthday! It's amazing what all your blog has accomplished in one year :) I am following you on BlogLovin. Thanks for your msg and Happy first bday! Congratulations for your first year!!! Thank you for organizing this giveaway for McQ scarf, very posh indeed! Hi Athina! Congratulations on your 1st anniversary! Such a good giveaway, thanks for letting me know!!!! Congrats! i just found your blog and i am glad i did. What a great piece for the giveaway! Great giveaway! love the scarf! Me apunto , ya te seguía de antes en bloglovin ¡¡felicidades por el año con blog!! Congrats on your first year! :) Great blog! I'm following on bloglovin to keep updated! congrats on your 1st birthday! Congratulations! Love the scarf and your blog. Congrats on your first year! All outfits are amazing! OOOooooo! Me likey! I've never won anything before but I love your blog and style. Happy 1st birthday! Love the scarf and thank you for the great giveaway! P.s. I love your hair, and your style is amazing. HAPPY ONE YEAR!! I hope to be somewhere close to feeling as you do in a year with my blog! Thanks for the inspiration!! Love love love your blog! Happy first! I've followed on Bloglovin. Congratulations on your anniversary! Happy 1st Birthday! You have achieved so much in one year, congratulations! Hi! LOVE this blog! Do you mind if I follow via GFC! Email me at: aotherkindafashion@yahoo.com Like fashion? Come over to my bloG like now! Happy Birthday to you!!! And congratulations on your great blog! !